It is with much regret that Cardiff Bach Choir must record the passing of Clifford in December 2018. Besides his great musical talent, his sense of humour and his sheer joy at making music will be well remembered by members who sang under his baton. The Choir is a fitting legacy to Cliff who conducted us well into his 80s and returned to contribute to our 50th anniversary concert in 2012. ​The Choir was founded by Clifford, who hailed from the Welsh valleys and who devoted his life to the teaching and performing music especially the works of Bach. A boy soprano who went on to become an acclaimed tenor, Cliff saw the need for a choir to promote the works of Bach and, with a group of friends from the BBC Singers, in 1962 he formed the Cardiff Bach Choir. Cliff taught at Cathays High school in Cardiff before joining the staff of Cardiff University as head of Vocal, Choral and Practical studies, a post he held until his retirement in 1989. He also taught and conducted in the USA. 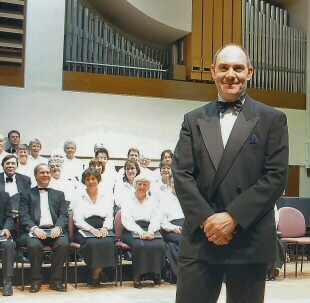 Cliff retired as conductor of the Choir in 2003 but remained its president and continued to take an interest in the affairs of the choir until his passing. Tim took over as Music Director for Cardiff Bach choir in 2003 when Cliff Bunford retired. As a former student at the university, studying and working with Cliff he was a natural choice to succeed him. Tim comes from Somerset and studied at Cardiff University where he graduated with honours and then continued at Cardiff as a post graduate studying composition. He joined the University staff and remained there until his retirement in 2015. Tim is an accomplished musician and conductor, playing organ, piano and violin. As a composer he has had works performed in the UK, Europe and America and following his recent retirement hopes to be able to spend more time composing. The choir have frequently performed works either written or arranged by Tim.